South Park Season 5 Episode 5: "Terrance and Phillip: Behind the Blow"
Narrator: At the tender age of six, Terrance and Phillip were off to the United States to perform on the Ed Sullivan Show, where American audiences would be exposed to Canadians for the first time. Ed Sullivan: And now, ladies and gentlemen, we have two adorable little boys from Canada. Please put your hands together for the music of young Terrance and Phillip. 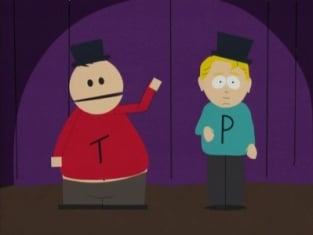 Terrance and Phillip: Beef and lamb, chicken and ham, step to the left and clap your hands. Gosh we love that chicken and ham. Don't let it go to waste, chicken and ham. Woman in audience: Oh my God! What's wrong with their heads?! Man in audience: It's alright, darling. They're just Canadian. Terrance and Phillip: Beef and lamb, chicken and ham, step to the left and clap your hands. Got a little left, chicken and ham. Don't let it go to waste, chicken and ham. Narrator: The Canadian act confused American audiences. But then something happened that would change Terrance and Phillip's act forever. Narrator: It was the birth of Canadian comedy.